Specs: Strenous trekking, at least 8 hours per day, mostly assault; Margaja Valley (old crater), new crater, Makawiwili peak, mountain lagoons, bird watching, Mambukal hot spring resort. 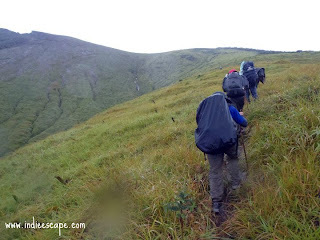 Trekking time: 1 day to base camp; 2 days descend.
. Mt. Kanlaon is the highest mountain in the Visayas and the 3rd largest active volcano in the Philippines. It is also spelled as Kanla-on or Canlaon.
. A climbing permit from DENR is required to climb this mountain volcano (P350 per person).
. The number of climbers is limited to 10 persons plus the local guide(s).
. From Citilink terminal in Cebu, the v-hire van fare to Toledo City is P100 per person.
. The fast craft fare from Toledo City, Cebu to San Carlos, Negros Oriental is P120, plus P15 terminal fee.
. The trike/padyak (3-wheeled passenger motorcycle/ bike) fare to get to San Carlos Transport terminal is P10 per person.
. 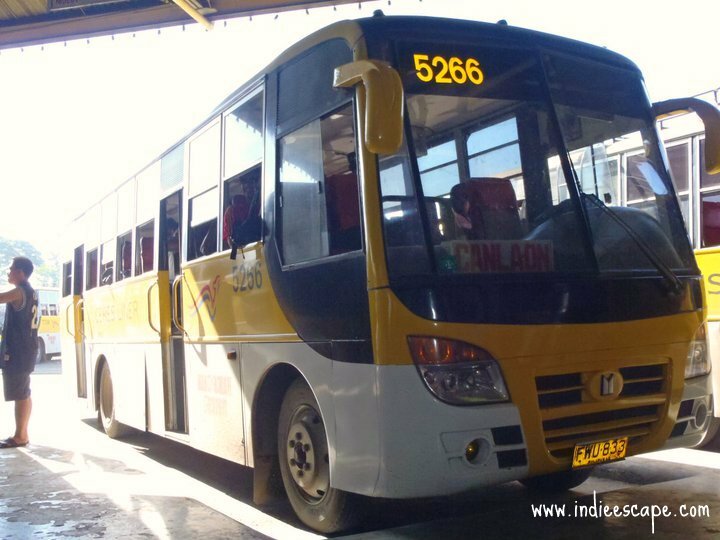 The bus from San Carlos City to Canlaon City is P55.
. The fare from Ceres South bus terminal in Bacolod City to Canlaon City is P90.
. Register and confirm your pre-approved climbing permit from the DENR office in Canlaon City. Guide fee is P500 per day (1:5 ratio), porter fee is P300 per day. The office can provide the guides and porters if you don’t have a pre-arranged one. I can recommend our guide, too (contact me for details).
. To get a permit, you need to fill out a form and have it notarized. Then, submit it to the park officer with your payment.
. Here is a copy of the form for download (coming soon).
. The habal-habal (tandem ride on a motorcycle) fare to Sitio Mananawin is P100. 4x4 jeepney or a Canter truck may also be rented for large groups.
. From the jumpoff, the trail starts on an exposed vegetable farm with a gradual sloping terrain.
. Have your lunch along the trail where water source is available (water pipes are laid on some parts of the trail); otherwise, push to ‘Patay na Ilog’ to have your lunch.
. When it rains, ‘Patay na Ilog’ (dead river) becomes ‘alive’. Be alert for the possibility of flash flood.
. As with most mountains in the Philippines, Mt. Kanlaon is a sacred mountain, so try to keep the noise down, especially upon entering the forest line.
. Once you exit the mossy forest, you will be able to see the crater and the saddle area (camp site) – it may look like a short hike away but it may take 2+ hours to get there because of the steep climb.
. A great sunset view waits at the campsite. From there, you can see the new crater (summit), Margaja/Margaha valley (old crater), San Carlos City, Cebu Island and the Makawiwili peak.
. Ask your guide for directions to the water source. For your safety, only use that water for cooking and cleaning.
. Be sure to bring cold weather clothing as the temperature drops after sundown.
. 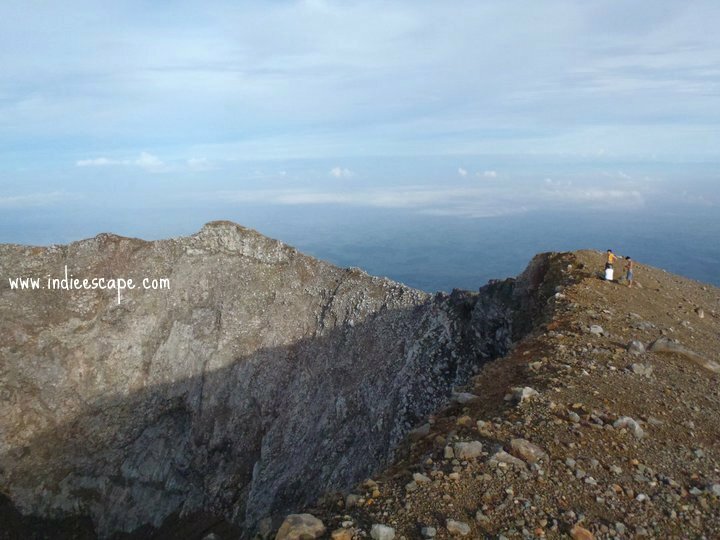 The way to the summit is rocky and steep but the view is breathtaking!
. Be careful when exploring around the crater rim because of the risk of falling into it.
. 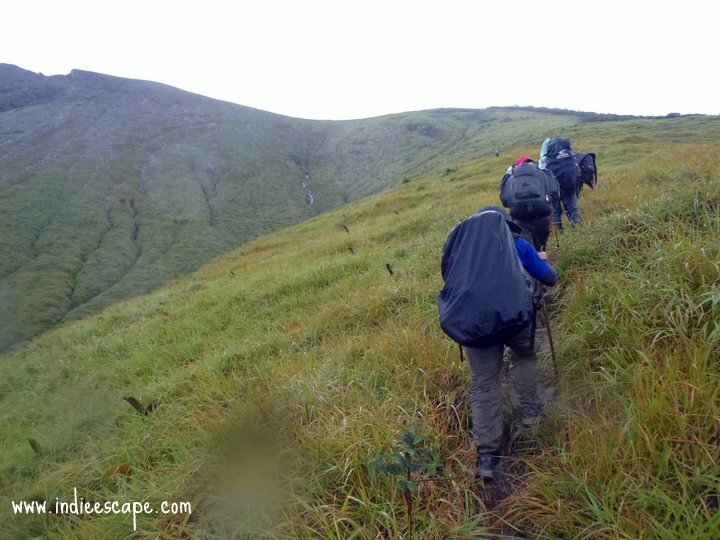 The trail to Makawiwili peak is gradually descending followed by another steep assault.
. Going down Wasay trail (longest trail in Mt. 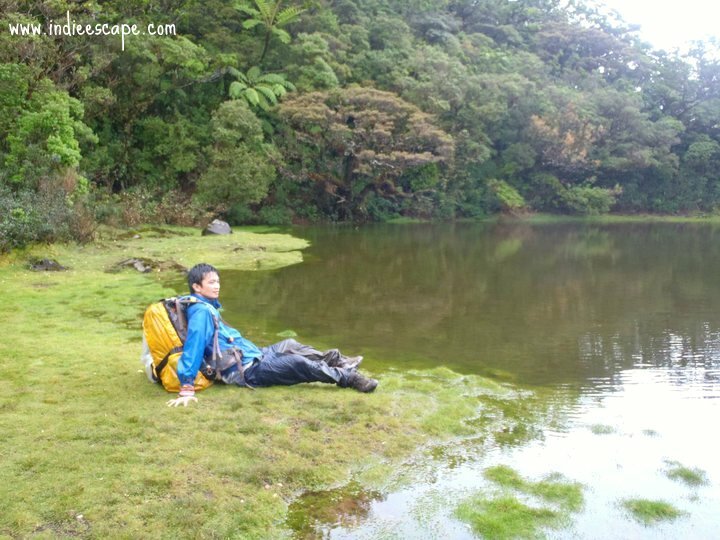 Kanlaon), you will pass by mountain lagoons: PMS camp, SAMOC lagoon and RAMS lagoon (a brief 15 min detour to this one).
. The Hardin Sang Balo campsite is still at around 2000masl high. Twisted mossy trees seemingly taken from an LOTR book surround this part of the mountain.
. The cemented road in the PNOC site is not the end of the Wasay trail. You may take your lunch here and proceed across the road to continue your journey.
. Munia bird sightings is one of the highlights of Wasay trail.
. After crossing the PNOC road, the trail will become maze-like with so many Y-branches. Be sure you get an experienced guide to avoid getting lost.
. Entrance fee to Mambukal resort is P30. There are additional entrance fees to use the swimming pool (P50), hot spring pool (P50), etc. Food and drinks are sold inside the compound.
. The bus fare from Mambukal resort to San Carlos City is P110. The jeep fare to Bacolod City is P35.
. Climbers coming from Manila may book a flight to either Cebu or Bacolod – whichever is more convenient.
. From Bacolod City, you may also take a bus bound to San Carlos City (via Don Salvador Benedicto), travel time is 3 hours. Then follow the itinerary from there.
. Other trails in Mt. 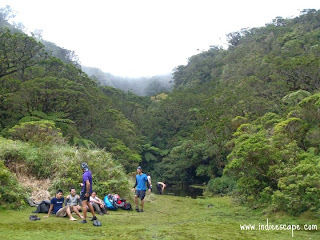 Kanlaon are: Maput/Mapot in Canlaon City, Masulog trail also in Canlaon City and Guintubdan trail in La Carlota City.
. You may camp out at the exposed saddle area or move on to the forested campsite on day 1.
. 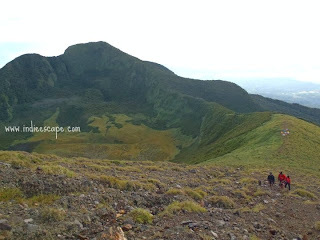 If you have extra time (and energy), you may go down Margaha valley and explore the old crater. It gets partially filled with water during rainy season.
. PMS camp, Samoc lagoon, RAMS lagoon and the area around Hardin Sang Balo all turn into a swamp after heavy rains.
. 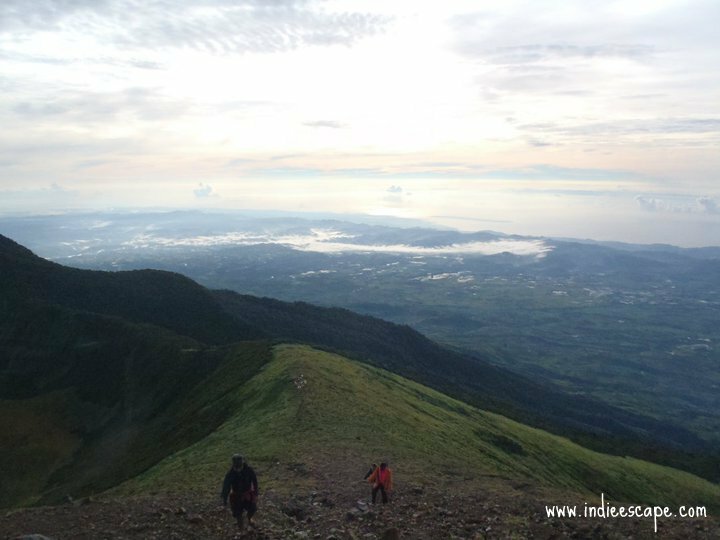 There many things to do in Mambukal resort like wall climbing, boating, climbing the 7-level waterfalls, treetop adventure, zipline, etc. Overnight lodging is available if you wish to spend the night there.
. The last trip to Bacolod City from Mambukal resort is around 8:00PM. You will have to rent transportation in case you will to get back in the city late at night.
. The last fast craft trip from San Carlos City to Toledo City is 4:30PM; so, you will have to spend the second night somewhere in Mambukal, Bacolod or San Carlos.
. There’s also the option of taking a ferry to Cebu City pier or a bus straight to Cebu City from Bacolod City. Last push to campsite - 2 hours away! 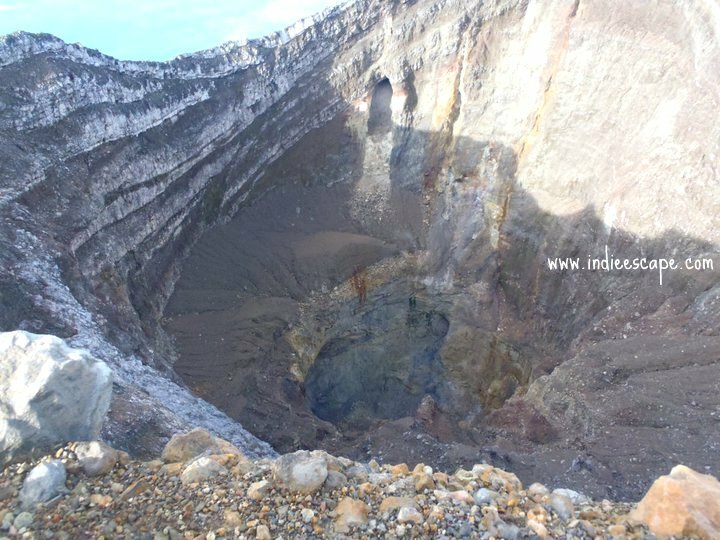 Hidden dangers lie on the crater rim so be extra careful! nice blog.. by anychance do you have a trusted guide you can refer? il be climbing kanlaon alone thi october and im looking for a guide that can help me.. thanks. Yes, I can recommend a guide for you. Are you from Manila? Pls send your email add here (I won't publish it). Hi Indie. 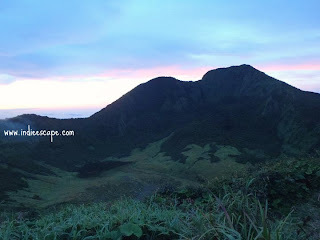 We'll be climbing kan-laon via Mananawin-Guintubdan. 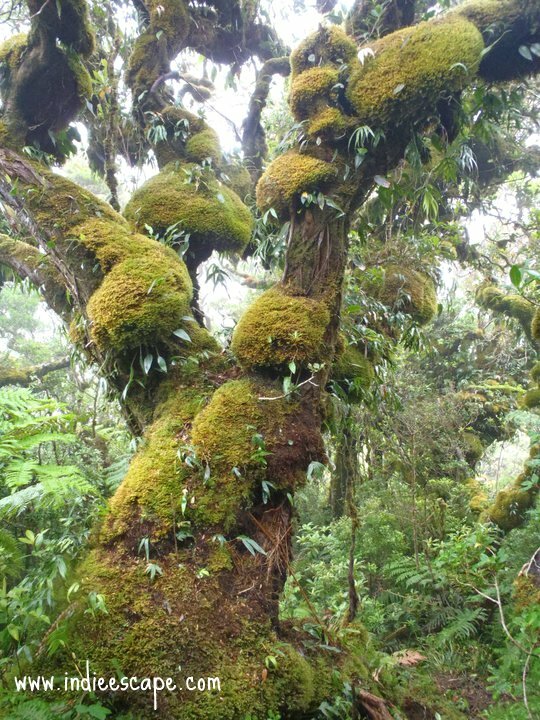 I would like to ask for some info about water sources along Mananawin trail if there's any. Thanks! Mananawin trail passes by vegetable plantations so you will pass by water pipes along the way before you reach the forest line. You can refill your bladders where you find tube segments (just be sure to place them back properly). The next non-stagnant water source is at the Patay na Ilog (river crossing portion). Sir Indie, do you have any contacts on the guides? help mo group namin thanks po. sir possible na gawin 1 day lang wasay trail? sir pwede pa send sa email ko yun para guide. hi, we'll be climbing kanlaon this oct 28-31 but me and my wife are planning to go to cebu after the climb. according sa itinerary nmin, DAY 3 and dating nmin sa baba ( Guintubdan Entrance Station) is around 12-1pm. ang last trip ng fast craft sa san carlos city is 3:45pm going to toledo. ilang hrs kya from Guintubdan Entrance Station or la carlota to san carlos pra maabutan nmin un last trip ng fast craft? 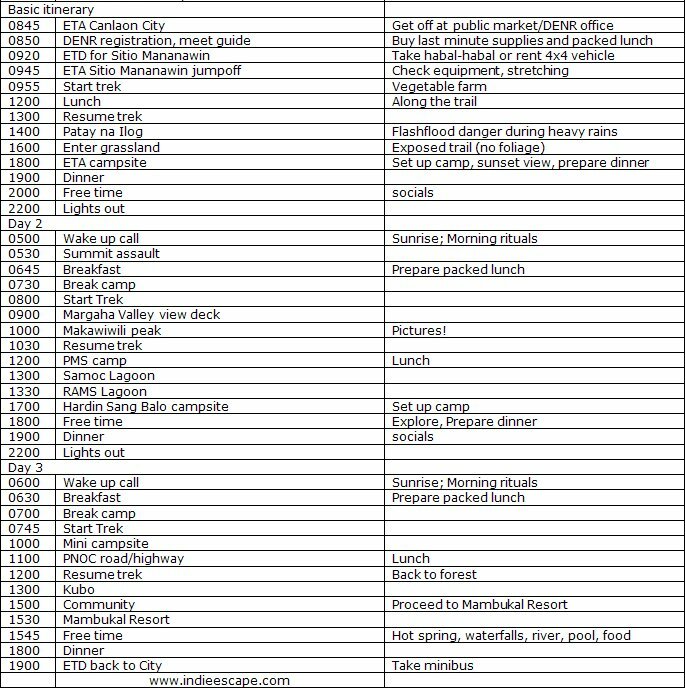 December 2012 (where we plan on 22 & 23 Dec as hiking days). 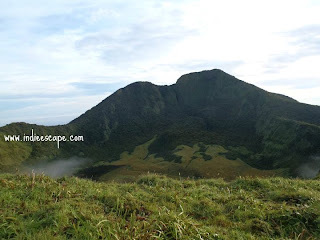 We emailed Sir Angelo Bibar regarding details about the hike, permit etc. but we didn't get any response. We are desperate to know the full on details which your blog proves to be informative and also a guide towards the trek. Not sure kung san exactly yung Guintubdan entrance station. Pero from Wasay trail, after resting in Mambukal Resort, we had to take a rented bus to Bacolod City (about 1 hour ride). 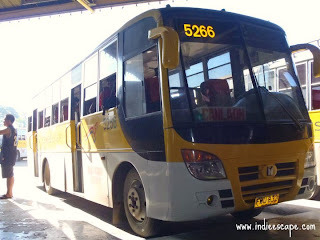 We got off at the bus terminal where we took another bus back to San Carlos (around 3 hours). From San Carlos we took a tricycle to the port and then Morning the next day na kami nakasakay (we took the first trip). Some of our companions took the midnight us back to Cebu City (Ro-Ro). I went with Cebu mountaineers kasi so our entry point was from Cebu. If you're planning to start from Canlaon City side, you can just drop by the DENR office in the public market. They can help you arrange your climb. I can't guarantee it but there should be slots available during off-peak season (peak season is summer). Hi IndieEscape! This is a very helpful blog you have here. 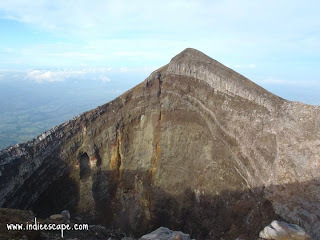 I'm planning to go for a Solo Climb in Mt. Kanlaon this January. Can you refer me to a trusted guide there? 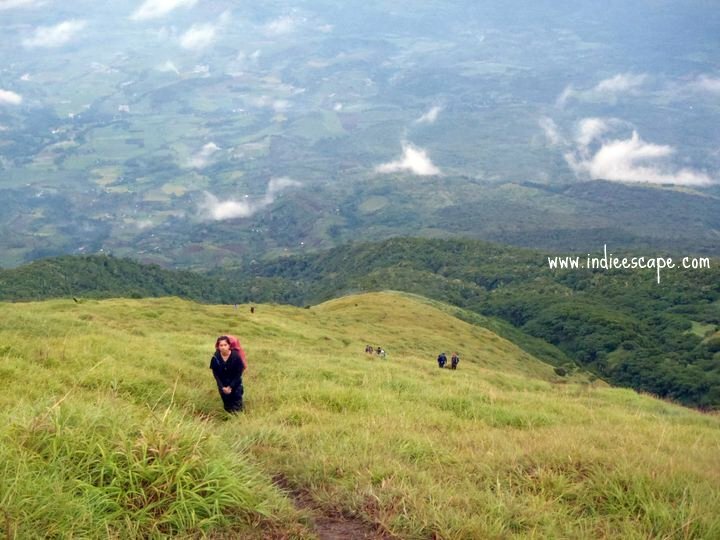 I am from Cebu and I'm planning to kae Mananawin/Wasay trail too. Thanks a lot and keep posting! Your blog is really helpful.